Busy, busy, busy. We’re all busy. You’re probably too busy to be reading this blog post right now. But you’re smart because let’s face it, the prospect of eating delicious cupcakes or hell – just looking at them – beats out whatever you’re supposed to be doing right now. Laundry? TPS Reports? Butchering a Whitney Houston song? You’re singing right now, aren’t you? Stop it, just stop. Look – cupcakes! Ooooh! Despite feeling like a generally productive person and loving to read about food maybe even more than I love puppies (that sentence felt wrong even as I was writing it. Who doesn’t love puppies?? ), I have fallen embarrassingly far behind on my google reader. How can this be? I’m a disgrace to my own nerdy kind! But there are a few blogs on it that I just love and can’t quit. Happy Go Marni is one of them. Her blog is full of awesomely delicious recipes complete with helpful how-to photos. When she posted these cupcakes made with two of my favorite ingredients, I just couldn’t help myself. Feeling up to the baking, but not up for dealing with my pastry tips and piping bags, I went for a low-fi decorating technique. I admittedly stole this cute and tasty technique from a wonderful cupcakery called Sugar Mama’s in Austin, TX. The honey adds such a pleasant sweetness, extra moistness and nicely ties the flavors of the honey-roasted peanuts and peanut butter together. Honey is one of my new favorite things to use in the kitchen. In the face of all those other questionable sugar replacers out there, it seems to be a safe, healthy and tasty option for sweetening. 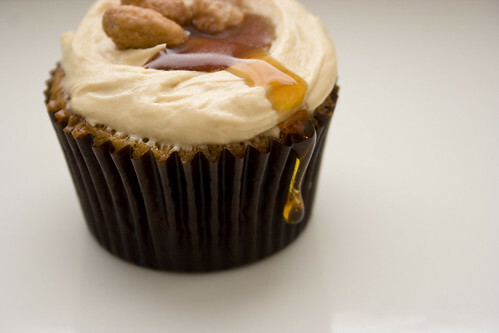 Plus, it goes super well with peanut butter and cream cheese. Just make a small valley in the middle of your icing with your offset spatula, fill it with a drizzle of your favorite honey and top with a few butter toasted peanuts. 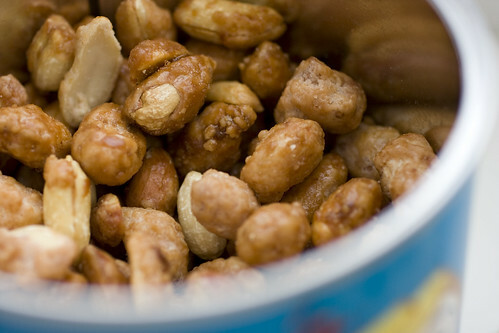 Since I was feeling extra lazy, I didn’t toast my own nuts (that sounds almost as wrong as the puppy thing). We picked some up from Zingerman’s in Ann Arbor, MI. I love Zingerman’s for many reasons, one of which is that when you go there, they happily let you sample lots of their delicious items. Fancy peanuts seemed like a pretty safe purchase for us, but after tasting them, they were without a doubt coming home with us. 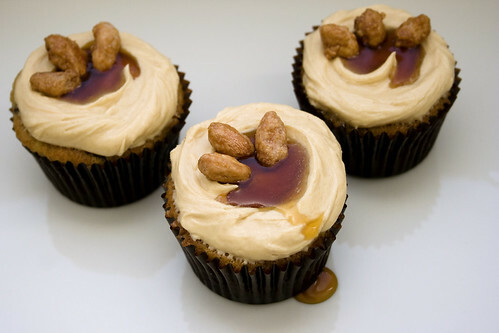 They are ridiculously good, crunchy sweet peanuts that are great on their own, but also make a great cupcake topper. 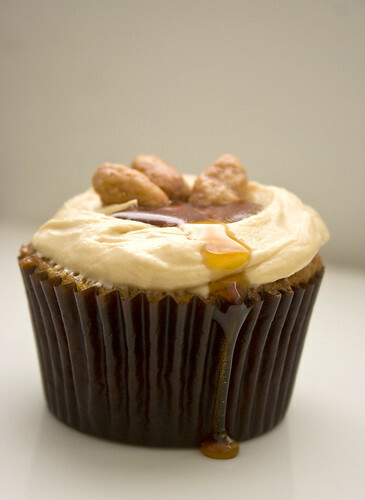 Get the cupcake recipe, complete with “how to” photos at Happy Go Marni and pick up some tasty Butter Toasted Peanuts from Zingerman’s. Those look really good. Such a great flavor combination.